Can ‘Find-My-iPhone’ help solve crime? This week, (17/09/14), a man has been jailed for four years after use of an iPhone App helped police track down the thief in 30 minutes. ‘Find-my-iphone’ is an app designed to help phone owners track down their apple devices in the case of theft or loss. All you need is to have installed the application BEFORE losing your iPhone, and then the App can be switched on via web or another Apple device. DIY CCTV – The Future of Crime Solving? 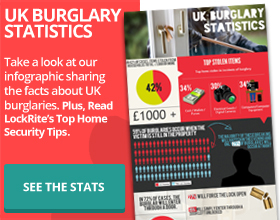 With recent inspections exposing UK police’s apparent reluctance to investigate high-frequency crime such as burglaries and car theft, it can be no coincidence that the market for DIY home surveillance is growing every day. People are looking for the next best methods or products to keep their homes safe, and today’s latest gadget is the Withings ‘Home’ security device. Will Apple make the Smart Home a reality? In recent years, Apple and Samsung have both expressed their desire to become the leaders in Smart Home development. For most, the idea of your phone being able to control many aspects of your home may seem a long way from becoming a reality. Nonetheless, recent technological developments have demonstrated that the idea of a Smart Home may not be as far off as we think. No matter where you are in the UK, you're never far from a LockRite locksmith. As the UK's largest network of uniformed, DBS checked locksmiths you can be certain of quality workmanship and excellent service at a very competitive price. Our national locksmith coverage ensures that we can provide a one stop solution for all your locksmith requirements. With 24 hour availability and an average response time of just 2 hours for our commercial clients, our nationwide locksmiths provide a reliable and professional locksmith service no matter where you are.